If you’re like most homeowners, you prefer to handle plumbing problems in your home on your own but not all problems have DIY solutions. Knowing when to identify plumbing problems that can easily DIYed (think common drain clogs) and major problems that could lead to injury or property damage if tackled yourself. Not sure how to identify the differences? Here are 5 signs it’s time to call a plumber. A sudden drop in water pressure can be a sign of a hidden water leak, pipe obstructions, or even city supply issues. Diagnosing this on your own can be annoying, frustrating, and can leave you with little answers. A professional plumber will be able to diagnose the cause of the drop in water pressure and provide an appropriate solution. Any time you are installing new appliances or going through a major renovation (especially in the kitchen! ), it’s crucial to hire a professional plumber to do this work for you. 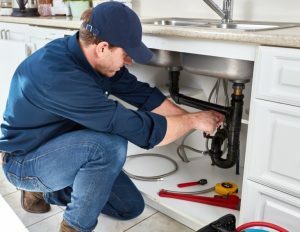 Oftentimes, these renovations and appliance installations require relocating things like sinks and refrigerators, which will require moving supply lines and necessary drains. DIYing these changes can result in significant damage to your homes plumbing, leading you to expensive repairs. Normally happening during the cold winter months, burst pipes can lead to major flooding and expensive repairs. When your home experiences burst pipes, it’s best to call in a professional plumber to ensure that the burst pipe is not only repaired properly but that the water abandonment process is begun immediately. With flooding, water can leak below your house into your foundation and affect the soil your home sits on and your plumber will be able to target all of these concerns! Sewer odors are typically a sign of sewer line problems. If you notice sewer-like smells inside or outside of your home, give your plumber a call as soon as possible to help identify the source of the problem to help avoid major sewer backup in your home. Are you experiencing regular, sever drain clogs in your home? This could be a sign of a blocked sewer line, which are typically caused by tree roots, non-flushable items building up, or sediment build-up. Calling in a plumber will allow you to accurately pinpoint the source of the problem and will be able to provide a safe solution. If the pipe blockage is due to a cracked pipe or punctured sewer line, your plumber will avoid major property damage to both your home and your neighbors. Are you planning a home renovation or are experiencing any of these problems? Give Plumbing 911 a call today at (330) 952-1900 or (216) 246-0566 to schedule your plumbing appointment.